Vive! Rewards is a loyalty point program. It is a great way to earn valuable points just for letting your friends know about Vive!. For every friend you refer to Vive!, you earn 1000 points. The person you refer receives our new customer discount. 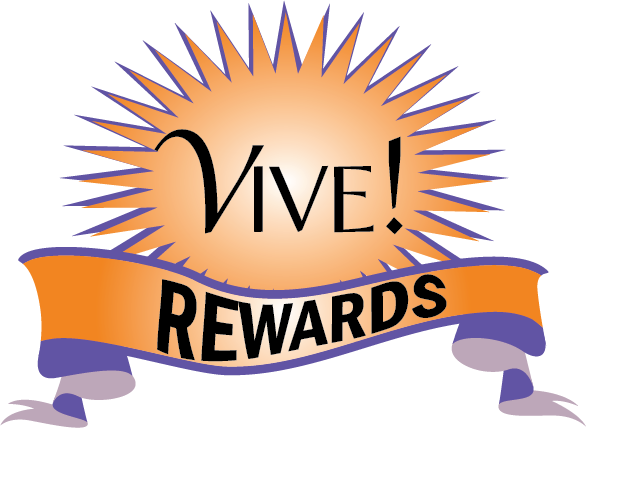 Each 1000 points can be redeemed for $10 toward any purchase at Vive!. Pay for your next massage, buy a gift card or products. You can spend your points any way you wish. Stay tuned. During the course of the year we might pop up some special rewards opportunities. There are lots of way to let people know about Vive!. We have included easy links for you in this email. Follow us on Facebook and share our posts. Review us on Yelp and share with your friends by checking in when you are here. Forward our newsletters to your friends. Buy your friends a gift card at Vive!. Follow us on Google+. Write a Review. Take some referral cards from the lobby and write your name on the back. Give them to your friends.